Discover two of New Orleans’ most fascinating features — ghosts and gators — on a 2-in-1 combo excursion that brings together two of the city’s top tours. 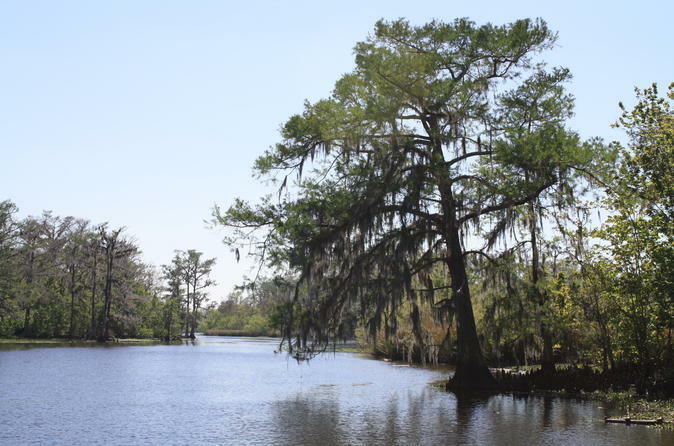 Spend the day aboard an airboat or pontoon boat exploring Louisiana swamps and spotting resident alligators. Later set out on an evening ghost tour of the French Quarter, keeping an eye out for ghouls, goblins, and vampires while your guide fills you in on the city’s spine-tingling history. You’ll even get to enter one of New Orleans’ known haunted locations. Begin your day with a swamp tour, exploring these forested wetlands aboard an airboat with a tour guide. Admire the luscious scenery, and keep your eyes on the water to see as alligators pass by your boat. You might also spot an albino alligator — a rarity usually only seen in zoos. The entire tour from hotel pickup to drop-off is approximately 3.5 hours. Later, you’ll meet a historian tour guide in the French Quarter for your evening ghost tour. Set out on a two-hour walk along the city’s storied streets, learning about local ghosts, vampires, witches, and Voodoo culture along the way. You’ll then get to step inside a real haunted location and perhaps even mingle with a ghoul or two. To make this evening tour even more “spirited,” pick up a to-go cup at one of the various watering holes along the way to enjoy as you go. It’s a truly unique New Orleans experience. Special Offer - Book and travel between August 1, 2016 and October 31, 2016 and save 20% compared to the local supplier's prices! - Book Now!